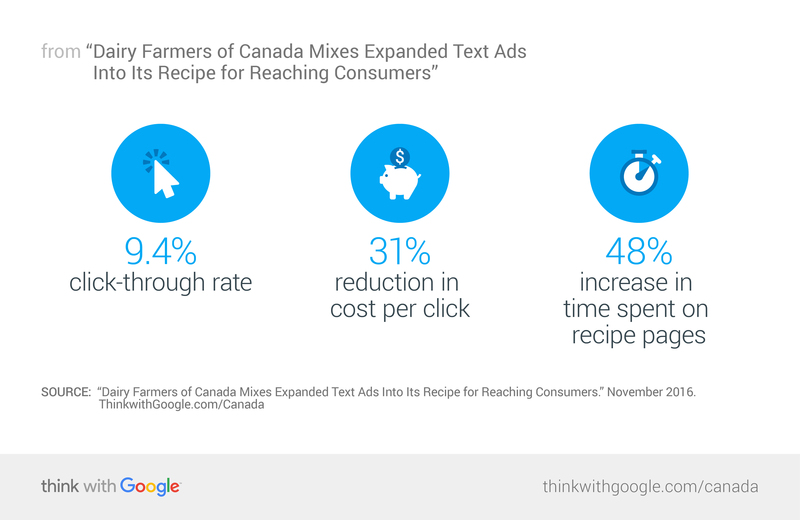 Dairy Farmers of Canada (DFC) had a problem: Some recipe pages had high bounce rates, but others were performing just fine. By digging into the search data, focusing its ad spend on users’ micro-moments, and using expanded text ads, DFC raised its CTR and engagement rates, even as costs went down. Dairy Farmers of Canada, an organization "run for farmers by farmers," exists to promote the quality and nutritional value of Canada's dairy products. To that end, DFC focuses its Search campaigns on driving consumers to its own sites, like Dairy Goodness, that feature articles, menu ideas, and an assortment of recipes. With no products of its own to sell, it can be tricky to link its web investments to an increase in dairy product consumption. DFC turned to other online actions to measure its success. "To solve part of the puzzle, we defined the increase in successful sessions to our recipe pages as a crucial KPI," said Patrice Bilodeau, web specialist at Dairy Farmers of Canada. "We assumed that in the absence of hard incentives like coupons, serving the perfect recipe to fit a consumer's need is as close as we can get to a conversion-like action. Our thinking is that if we can put the right recipe in front of consumers, we can expect them to go and buy dairy products." With the help of its media agency, Initiative, DFC found that its specific recipe pages (like this recipe for coconut curry beef noodles) showed much higher overall bounce rates than its recipe inspiration pages (like this search results page for "pasta"). To find out why, DFC switched its focus from what users are searching for to why they're searching for it. With a better understanding of users' search intent, it could use expanded text ads (ETAs) to provide as much information as possible to consumers in their micro-moments. Reprise, DFC’s search agency, found that bounce rates were poor when users were directed to pages that didn't specifically relate to what they were searching for. If a user searched for something specific like "squash soup recipe" and were directed to a general page with soup ideas, bounce rates were higher. If they were looking for "homemade soup" and were directed to a specific recipe page, for example, the bounce rate was also high. DFC switched its focus from what users are searching for to why they’re searching for it. Based on these new data-driven insights, Reprise restructured DFC's groups of search terms in AdWords around two types of micro-moments: general recipe inspiration and specific recipes. "The team took a categorization approach to recipe moments and separated people who needed to be inspired from people who were on the brink of cooking. We established an inspiration group and an action group and reflected the ad copy for these segments. The granularity of these segments allowed us to increase engagement by having a more precise consumer interaction," explained Hailey Smith, search manager at Reprise. DFC saw immediate results from the restructuring: CTR improved to 5.83%, an all-time high for the company. While restructuring its ad groups helped DFC be there in users' recipe-inspired micro-moments, the next step was providing more relevant information to users with ETAs in these key moments. Expanded text ads made sense for DFC because they improve visibility in search results (especially on mobile) and they allow for more characters. ETAs have two separate 30-character headlines and a longer 80-character description line, offering nearly 50% more space to feature products, services, and descriptive ad copy. DFC used ETAs to provide users with more information about the links right within the search results page. In the example below, the ETA made it clear that users would be taken to a collection of crepe recipes and not a specific recipe. The new ad format's value for DFC was clear. After replacing standard ads with ETAs, DFC saw a 31% reduction in CPC, a 48% increase in recipe content engagement, and an impressive 9.4% CTR. By taking a data-driven approach to figuring out why one type of recipe content was performing better than another, the Reprise and Initiative teams helped DFC bypass a potentially costly mistake of lowering (or completely abandoning) its bidding on specific recipe keywords. Instead, it got a closer look at why consumers were searching for recipes, allowing the organization to serve more relevant recipe content in users' search results. After finding success with ETAs and a new focus on micro-moments, DFC plans to keep testing and applying its insights to other campaigns. "Ad copy learnings, such as time of recipe completion, have helped inform ad messaging," said Noah Vardon, Initiative's vice president and client business partner. "Learnings from this approach will be fully integrated into 2017 media planning, allowing us to build a connection strategy that is designed to speak to specific moments and consumers' interactions with dairy." Focusing on being there, being relevant, and being helpful in consumers' many different micro-moments is a strategy DFC is sure to milk for years to come.